On a cutting board, using a sharp knife, slice the carrots and leeks diagonally into slices about half an inch thick (1,5 cm). Place a non-stick frying pan over high heat, adding 2 tbsp olive oil and the butter. Sauté the carrots with the leeks for 3-4 minutes until the leeks are translucent, sprinkling with salt and freshly ground pepper. When the carrots and leeks are ready, transfer to a bowl and return the frying pan over high heat adding the remaining olive oil. Season the lamb chops with salt and pepper and place on a baking tray lined with grease proof paper. Add the sage, the mustard with thyme honey and the spring onions to the lamb chops. Mix thoroughly, then lay out the chops on the baking tray adding the carrots and leeks around them. 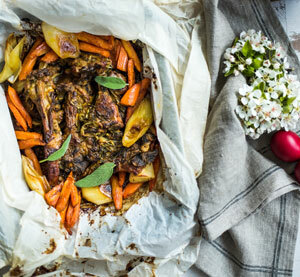 Wrap the grease-proof paper well and bake in a pre-heated oven at 180oC for 40-45 minutes. Bean soup with smoked ham shank Rack of Lamb in the Dutch Oven with a herb vinaigrette.